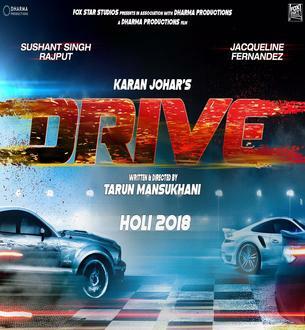 Drive is an Upcoming Bollywood Film in 2018, It is Action, Crime, Drama Film and Sushant Singh Rajput, Jacqueline Fernandez in lead roles. This film is Directed by Tarun Mansukhani and Produced by Karan Johar and Hiroo Yash Johar. It is made under the banner of Dharma Productions. Drive is scheduled to release on 7 September 2018. The film has started shooting. This will be Action film. There are only cars on the poster, which are giving it a sense of 'Fast and Furious' feeling. In it, Jacqueline received a roll of street racer. Nobody has played such a role in the Indian film world.